As a foreigner living the expat life you have the fabulous opportunity to go shopping in new and exciting places. Yes, I can hear your groans coming from various dark corners of the globe. I know you don’t all live in Singapore or Dubai or Paris, and some of you ache for the joy of exploring big, luxury shopping emporiums, but trust me, fascinating shopping experiences can be had in other places. 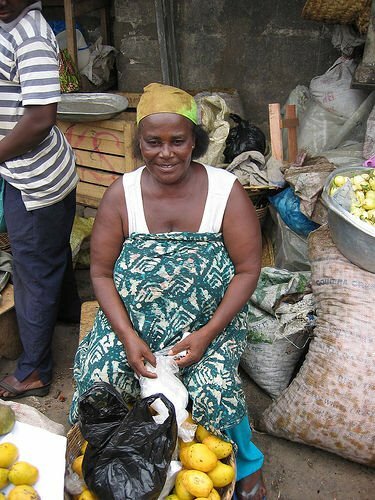 Such as Makola market in Accra, the capital of Ghana, West Africa. Just read on and you’ll understand. One morning over coffee my friends Tara and Natalie and I plan a trip to Makola market. Tara from Canada is in need of bead supplies for her jewelry-making business. Natalie from the USA needs a wedding dress. Instead of a wedding at home in California, she and her man Max prefer a Ghanaian ceremony here. Contemporary Ghanaian fashion being stunning, Natalie covets a locally designed gown, and what better place than Makola market to buy fabric? Me? I‘m looking for a length of market cloth. Something bright and colorful for a skirt, and maybe some for a table cloth. I never have enough fun table cloths. And maybe there’ll be something else that strikes my fancy. African markets are fabulous places, and don’t let anyone tell you different. You can find things there you won’t find in any shopping mall in America, no matter how much money you have. Such as mud cloth and thunder stones and dried shrimp by the kilo and little monkey skulls and porcupine quills. And of course you can buy interesting food and charcoal braziers and cell phones and long wooden fufu pounders. Oh, and let’s not forget the beauty products, such as bleaching creams and hair dye and shea butter, which is wonderful stuff for chapped lips. I tried it out during our cold and dry Christmas visit to Virginia, and I had lips soft as a baby’s bottom. However, interesting similarities exist. In Makola market, as in an American shopping mall, you can have your hair done, your shoes repaired, and your teeth fixed. It’s cheaper in the market here, but you might want to pass up some of these services. An American shopping mall is redolent of money and perfume and potpourri and greasy french fries. Makola has smells you will never encounter at the mall: Roasting plantain, simmering palm nut soup, dried fish, open gutters, goat droppings. Really, it’s a mind-expanding experience. So, one sweaty tropical morn, the three of us pile into a pink taxi and find our way to the sprawling market downtown. First we go in search of Tara’s beading supplies. She’s a master at bargaining and makes the market mammies laugh even when they don’t get the joy of suckering a big price out of an obruni (foreigner, white person). Mission accomplished, we head for the cloth section. It’s easy to become over-stimulated taking in all the noise, color and busy-ness of the market. The selection of cloth is staggering. Stall after stall after stall has neatly folded lengths of cloth on display, hanging on racks or stacked in colorful piles. We study the various motifs incorporated in the designs. Birds, flowers, fish, an occasional fruit or vegetable are to be expected, as are the traditional adinkra symbols, Ashanti stools and cowry shells. More unusual are the various human body parts that appear in the designs–eyes, hands, knobby feet. 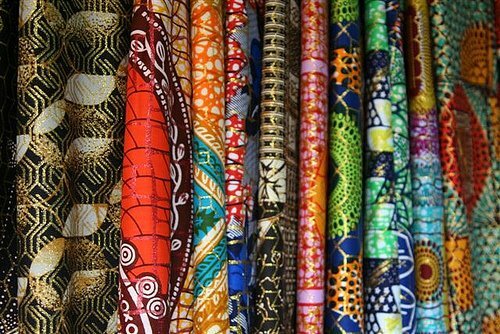 Icons of modern civilization also find their way on African fabrics — cell phones, keys, screw-in light bulbs, computers. I have no trouble at all finding fun pieces to use as table cloths. But interesting as they are, these fabrics are not suitable for a wedding dress, at least not the one Natalie has in mind, so we plow on down the crowded streets and alleys, trying not to trip and fall into a slimy, putrid gutter. We discuss Natalie’s wedding dress needs with several market ladies. They are friendly and curious. “You marry a Ghanaian man?” they want to know. “I am sorry,” I say solemnly. Marital unhappiness is a sad thing. They all laugh uproariously, their bosoms quivering in merriment. One thing they don’t have in Makola Market is snooty salesgirls wearing size one clothes and four-inch heels, the type of chick who looks down her nose at you in your size eight or ten. These Ghanaian women wear flip-flops and their generous bodies are wrapped in market cloth with designs of fish or neckties. They tell us we are too skinny and should eat more fufu. They’re fun and helpful and point us in the right direction and finally, Natalie finds her fabric. It’s white with shimmery ribbons of bright color running through it. It’s gorgeous. Will work great with the pattern she has chosen, a modern Ghanaian fashion design. I can’t wait to see it. By now we are exhausted, hungry and thirsty. There is no such thing as a food court in the market – food is everywhere, carried on women’s heads, bubbling in pots by the side of the road, served up in little chop bars along the street. The three of us consider our needs, which include a place to sit and rest, and sanitary facilities, preferably of the enclosed variety. So we bail out of the market and find us a funky Rasta eatery nearby. It’s one the Peace Corps volunteers enjoy so it’s good enough for us. And just like our sisters back home in vast shopping malls and big city shopping centers, we have lunch. Not a Greek salad, though. Do you have a fun or interesting story about an expat shopping experience? Do you like open markets in tropical countries? What do you like to buy there? NOTE: I love that gorgeous photo of the market fabric at the top of the story. Andrea Papitto, the photographer, started an NGO (Non-Governmental Organization) called Planting Technology that donates computers and Internet access to rural schools in Ghana. I love markets – shopping malls are so sterile and boring. Wandering down hidden alleyways, not knowing what treasures you’ll find around the next corner, although having said all that – I do like my food to be cold and freshly shrinkwrapped in plastic! I read your post about your daughter in Togo. Very nice! Your daughter sounds like the perfect Peace Corps volunteer. Africa gets in your blood. I married my husband in Kenya (decades ago) where he was a Peace Corps volunteer. He’s been doing development work ever since. Our first daughter was born in Ghana. We’ve lived in several other countries, as you can tell from this blog. We love Africa and hope to go there again. Now my question: Why don’t you join the Peace Corps 😉 ? Middle Age no problem! Thank you all for visiting my blog and your nice comments! Please come back for more adventures. I would love to go to a market like that- sounds like you really enjoy it. I know I would. Love what I’ve seen of your blog so far. Found you at BPOTW. Love this post. I have been to many markets like that and I love the charm. So much more fun than an American mall. I do as little shopping as possible but I would have loved to been with you! OMG! I must have a monkey skull now. Can I buy one online ? I am closer to the German border, in Metz (Paris is about 85 minutes and 55€ away on the fast train), and love everything here except the weather! Alas, I do not have a long-stay visa, so I return to California in early August. My husband travels all over the world on business. My house is full of wonderful stuff from all over the globe. Ghana is one country he hasn’t been too. I love your blog, and I will be back! Thanks for the follow. Passing through. When I moved to France, I outfitted my apartment in one weekend at the braderie (open air market). And I was thankful for it, because I had the bad sense to move here on Easter weekend and everything else was closed! I love this story. Reminds me of my three years in China as a VSO (British equivalent of Peace Corps). The only way of getting food was to get up at 5 am and bargain with the farmers at the local market for cabbage and tofu. The African markets in South Africa are colourful and vibrant places. I love them. I am in love with markets! I love supporting independent local businesses vs. big corporations. I wish, wish, wish I am able to go to Ghana in the future! To shop there, bring the goods home, and show the world what beautiful things this earth hold for us! Can’t wait to check out the market when I’m in Accra in a few weeks. Great post. Love the pics! I kind of miss the old Ghana, but there are days when a cappucino at a little cafe are just what you need! And now you can get that here! Pale Observer, A great post, and yes things have changed very much in the last ten years. We saw the beginnings of the “cosmopolitan” changes: Frankie’s and supermarkets. The magazine photo of that African guy is amazing! Jungle Mom, Thanks! My job is to entertain. Marja, leuk je hier te zien! Yes, open markets are fun. When I visit Holland I love the open street markets. In Sneek, where my family lives, there’s one on Tuesdays and Saturdays, with a street organ cranking nearby! Hi Trish! Glad you remembered the trip and thanks for the photo offer. Yes, all the beads are mine. I came away with kilos and kilos of beads! How can you not when you live in Ghana. It was so much fun buying them there. Great fun, it was nice to remember the trip. If you ever need photos just let me know. I probalby have lots. Are all the bead yours? Here in NZ are not many markets We’ve got only one big one in Christchurch on a sundaymorning. I have been looking around your blog. I love it!